This outdoor, family-friendly event takes place on Saturday, July 22nd from 11:00 a.m. to 4:00 p.m. in the green space adjacent to the Folkmoot Friendship Center, 112 Virginia Ave, Waynesville, NC. Scheduled immediately after the Waynesville parade, Many Cultures Day features youth activities hosted by community groups, international dance and music performances, community dance lessons, face-painting, airbrush tattoos, and a youth performance stage with local youth fiddlers and dancers. Additionally, we have two Cherokee stickball game demonstrations. The cost of this outdoor festival is $5 for individuals over 5 years. Along with everything else, Many Cultures Day hosts 30 vendors. Artisan vendors share cultural beadwork, handcrafted jewelry, pottery, furniture, handbags, Lularoe clothing, sewing, woodwork, and lots more. We are expecting food vendors serving baked goods, ice-cream, kettle corn, snow cones, Caribbean style cuisine, specialty wraps, and other delicious treats. Make sure you come to the Friendship Center immediately after the Waynesville Parade. The parade is Saturday, July 22nd at 10 a.m., starting at the First Baptist Church and continues on until the Courthouse where the dancers do a demonstration for elected officials. The parade features not only Folkmoot’s international groups, but also local musicians, dance teams, giant puppeteers, and stilt walkers. 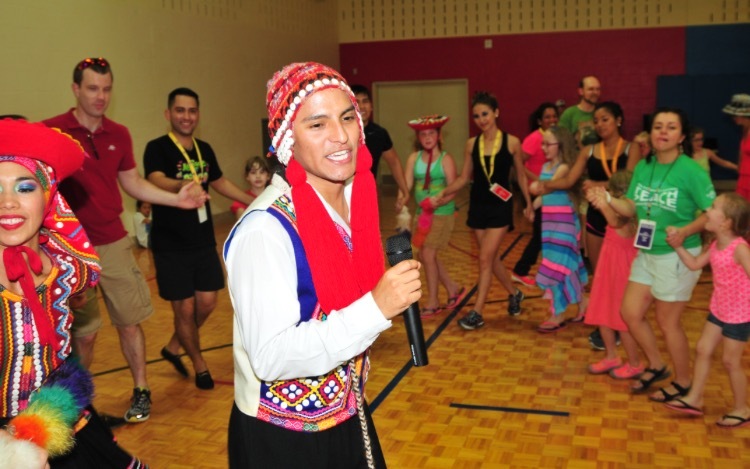 Folkmoot USA, North Carolina’s International Festival, is a two-week celebration of the world’s cultural heritage through folk music and dance. Held each summer throughout the beautiful mountains of Western North Carolina, Folkmoot features performers sharing their culture through colorful, authentic, and original reproduction costumes, lively dance, and traditional music.In 2017, Folkmoot anticipates hosting musicians and dancers from India, the Netherlands, Slovenia, Argentina, Russia, Israel, Taiwan, a Canadian group representing Welsh dance, a U.S. group representing African dance, Eastern Band of Cherokee Indians performers, as well as several regional bluegrass and clogging groups representing Appalachian culture. The excitement continues on with cultural performances, parades, exhibitions, and more through Sunday, July 30th. There are festival events in Waynesville, Lake Junaluska, Clyde, Hickory, Cherokee, Canton, Flat Rock, Maggie Valley, Greenville, Franklin, and Asheville. For more information call 828.452.2997 or email info@folkmoot.org.